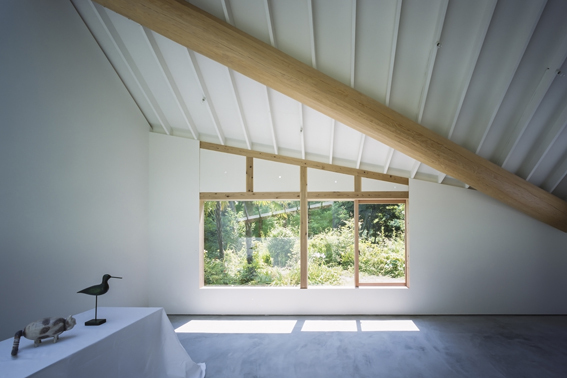 The light sheds is a photographer’s studio that stands in the garden of his existing house, located in the hilly region of southern Kanto. The space is solely composed of essential functions required for a photographic studio and the result is one single room of 4.5m by 7.2m. 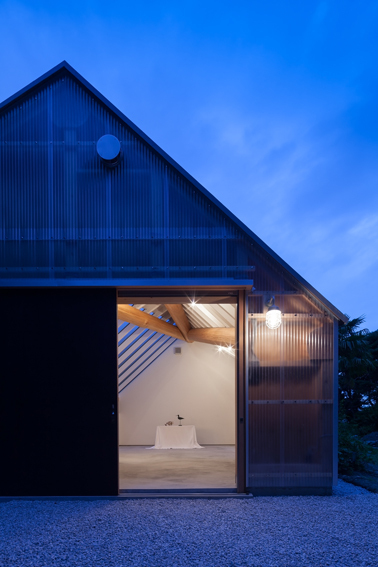 From the start, we had a simple concept of creating a simple, pragmatic sheds. In order to form a large volume out of the limited budget available, a timber frame, gable roof structure was selected. 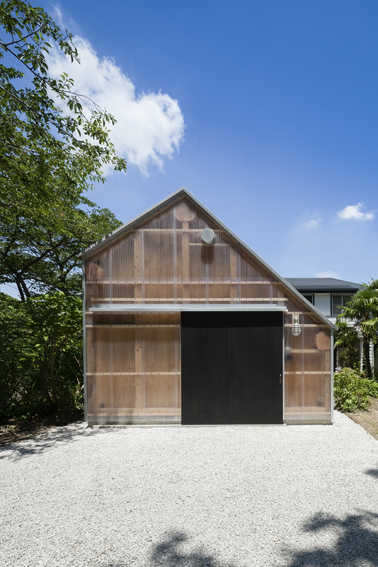 However, a gable roof would typically entail horizontal joists, which would reduce the clear height required for photo shoots. 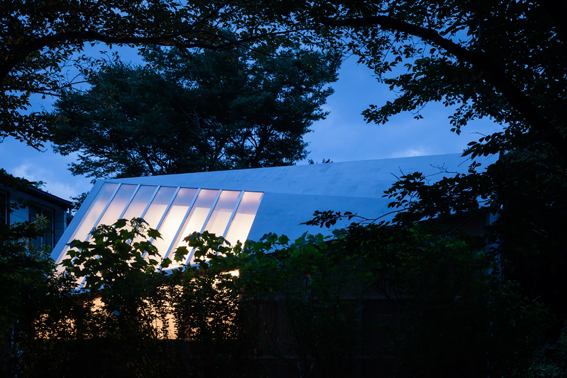 Following simple geometric rules, the roof was distorted into a multi-facetted, asymmetric form. 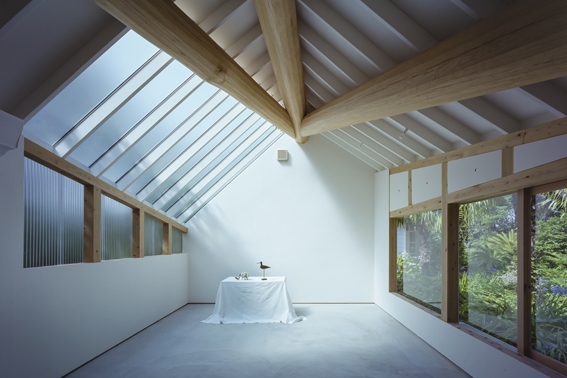 Three ridge beams at the folding lines support the roof structure, negating the need for any horizontal members that may compromise the height of the room. 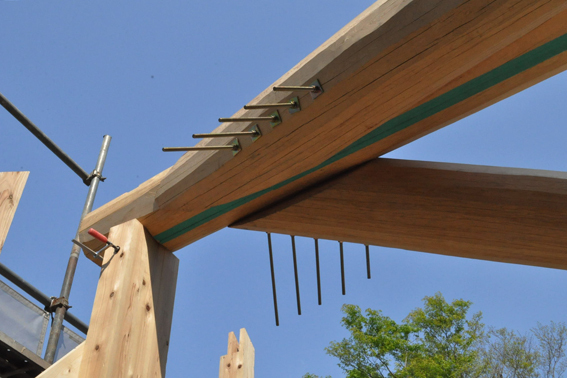 Logs were selected for the ridge beams, for their ability to accommodate the complex assembly of timber rafters at various angles. Translucent polycarbonate panels reveal the “back of the stage set” timber framework of the walls. Like artists’ ateliers, photographic studios require ample ambient light. Direct sunlight creates overly strong contrasts that would result in unnatural portraits. 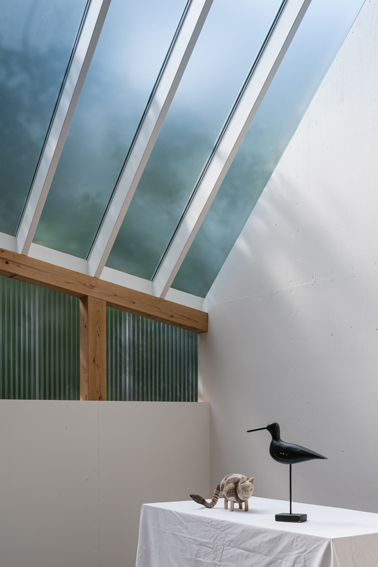 A combination of skylights at 45 degrees and a clerestory let in diffused light from two different angles from above. 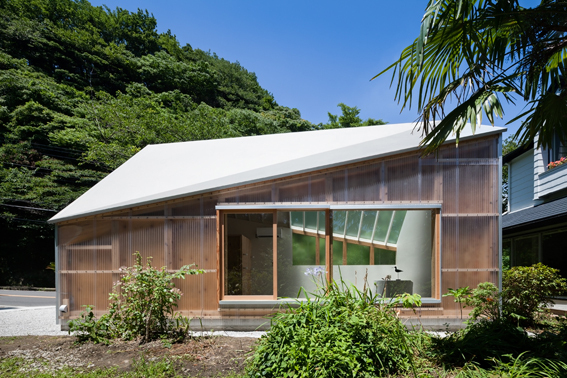 Together with the wide windows on the side facing onto the lush garden, the interior, although enclosed, is always as bright as the external environment. 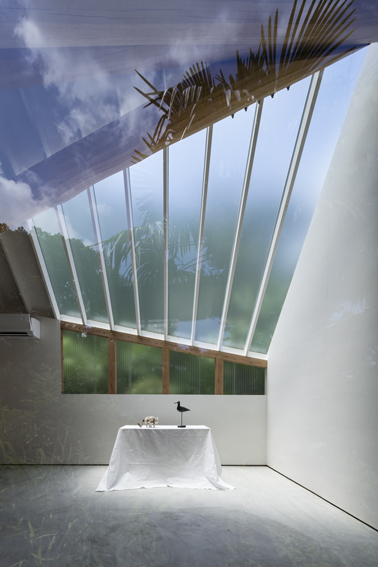 It has the duality of being both outside and in, blurring the conventional architectural boundaries. 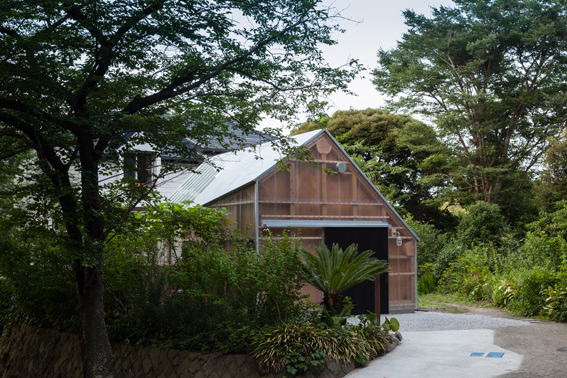 Ever since the practice’s first project, c-office, an office for a Japanese timber manufacturer, application of pragmatic structural solutions has been the core to our approach in all projects. 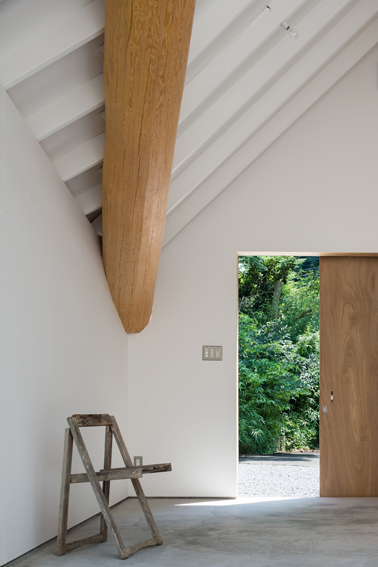 We have also been continually exploring ways to inherit and translate the purity of traditional Japanese timber compositions into modern construction. 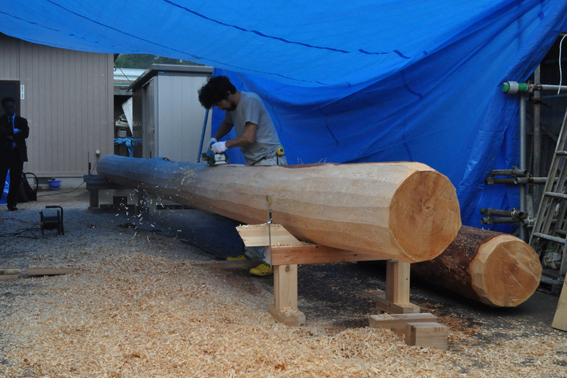 Here, while the log beams were employed as pragmatic means to fulfil the brief, they also bring along symbolic associations of being one of the oldest building material. In this project, we were able to test the modern significance of this primitive material through using it as a meaningful device to create a man-made enclosure where photographic subjects can be exposed in “natural” light.